Whatsapp developers has been doing their very best in order to see that whatsapp becomes the leading social media messaging app. And to have it, their works shows the best in them. Everyday by day, more features are been rolled out on whatsapp, for the past few weeks or month there about, new features were added to whatsapp chat, and some of the features include; group invite link, gif support, video calling and so many other features you would love to use. Also, hope you know about GBwhatsapp that gives you freedom to use any feature and to customize the way you want your whatsapp to look like. The latest version 5.30 is on ground now, get it and enjoy chatting friends. 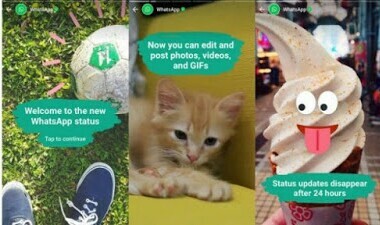 As Instagram copied the "Story" feature from Snapchat, also that's how the new WhatsApp feature called "WhatsApp Status" was inspired by Snapchat. Uses of this newly introduced whatsapp feature, it allows users to share photos, videos, and GIFs as your status (i.e. as stories) which will auto-destruct in 24 hours. As you may know, initially this feature was rolled out to beta testers only in the month of November as of last year 2016, now the good news is that, the feature is now available for all users. It Works like Instagram stories, and also give you the full control over who sees your "Whatsapp Status". This whatsapp feature which is now available for both android and iOS users, is been pushed to users on whatsapp via batch by batch. So when it gets to your own turn to receive the update, yours will be updated. Now, relax and expect your own feature pushed to your device as soon as possible. We love comments and Appreciation, so do well to show us your commitment to this blog by showing forth your thanks via comment box. Thank you.